Arthritis is any disorder that affects joints. Rheumatoid Arthritis (RA) is an inflammatory disease that causes pain, swelling, stiffness, and loss of function in the joints. It has several features that distinguish it from other kinds of arthritis. A movable joint is a place where the ends of two bones meet and move relative to each other. Movable joints are surrounded by a joint capsule enclosed in a synovial membrane (the synovium) that produces and contains synovial fluid. This clear fluid protects, lubricates, supports, and nourishes the cartilage and bones inside the joint capsule. Cartilage covers and cushions the ends of the two bones. In Rheumatoid Arthritis, the immune system for reasons unknown attacks a person's own cells inside the joint capsule. White blood cells that are part of the normal immune system travel to the synovium and release cytokines that attack synovial cells, which in turn release other destructive substances. These destructive substances cause the synovial membrane to grow new blood vessels and form a thickened area called a pannus. As the pannus grows it invades and destroys areas of bone and cartilage. This destruction leads to an inflammatory process (synovitis) in which the cells of the synovium grow and divide abnormally, making the normally thin synovium thick. Fluid builds up inside the joint, resulting in a joint that is swollen, puffy to the touch, warm, red, and painful – the classic symptoms of RA. As RA progresses and continues to destroy cartilage and bone within the joint, the surrounding muscles, ligaments, and tendons that support and stabilize the joint become weak and unable to work normally. All of these effects lead to the pain and deformities often seen in RA. 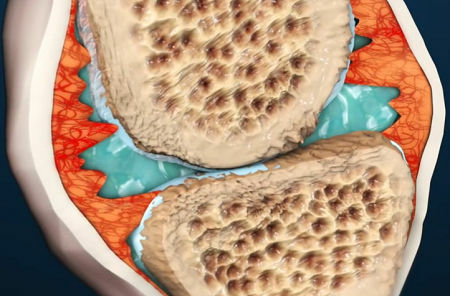 This process can eventually lead to ankylosis, in which the bones grow together (fuse) and become immobile, making it impossible to move the joint. Doctors studying RA now believe that damage to bones begins during the first year or two that a person has the disease and this is one reason early diagnosis and treatment are so important. Rheumatoid Arthritis is the second-most common type of arthritis and affects some 0.7% of Americans, three times more women than men. Onset is usually in middle-age, but also occurs in the 20s and 30s. Researchers suspect that some type of microorganism may be the trigger in some people who have an inherited tendency for the disease. Dr. Hoekstra, MD has found that virtually all the patients he has studied have had significant amounts of a bacteria called Propionibacterium acnes. "This is the genus and species of the organism we believe is responsible for propagating and perpetuating this disease," says Dr. Hoekstra. "It is a very common bacteria in an altered state of being – it is cell wall deficient." The bacterium was first identified and described in 1981 by G.A. Denys at Wayne State University in Detroit, Michigan. "This bacteria is passed transplacentally, from mother to fetus, and this may be responsible for RA showing up in generations in a single family," says Dr. Hoekstra. Why this bacteria is prevalent in seemingly all cases of RA is not clear, but overuse of antibiotics may be a factor encouraging its growth. "The use of antibiotics is one of the most potent ways of inducing cell wall deficiency; bacteria seem to do this as a survival mechanism." In other words, when a bacterium is transformed into a cell wall deficient form, it assumes different characteristics from the whole or native type of microorganism it used to be. Dr. Hoekstra explains, "The organism remains intact except for losing its cell wall and its antigenic characteristics, enabling it to function as a cellular chameleon." When it loses its antigenic signature, the bacteria are able to mask themselves against destruction by the immune system's antibodies which can no longer recognize them as antigens (foreign proteins). Dr. Hoekstra's mentor, Lida Holmes Mattman, Ph.D., also of Wayne State confirmed the causal role of P. acnes in a laboratory experiment. Dr. Mattman extracted the bacteria from the synovial fluid (which lubricates joints) of human arthritis patients, and injected it into chicken embryos. The chicks then exhibited symptoms of RA. When she treated the chicks with antibiotics known to disable P. acnes, the disease disappeared. Another recently discovered aspect of RA is that sufferers who were previously thought to have overactive immune systems, instead may have exhausted immune systems. ''What this study has shown for the first time is that patients with RA have prematurely aged immune systems'' said lead author Dr. Cornelia Weyand, a rheumatologist at the Mayo Clinic. Rheumatoid Arthritis generally occurs in a symmetrical pattern so that if one knee or hand is involved, the other one is also. The disease almost always affects the wrists and hands (especially the finger joints closest to the hand) but can also affect the knees, neck, shoulders, elbows, ankles, feet, hips, and even the jaw and spine. Some people also experience the effects of RA in places other than the joints; about one-quarter develop rheumatoid nodules – bumps under the skin – that often form close to the joints. It can affect the eyes, skin, heart, lungs, kidneys, nervous system, and digestive tract. There is currently no cure for Rheumatoid Arthritis. Although RA can have serious effects on a person's life and well-being, current treatment strategies – including pain relief and other medications, a balance between rest and exercise, and patient education and support programs – allow most people with the disease to lead active and productive lives. In recent years, research has led to a new understanding of RA and has increased the likelihood that, in time, researchers can find ways to greatly reduce the impact of this disease. When other treatments don't work, surgical joint replacement (arthroplasty) or joint fusion (arthrodesis) are options for both large and small joints. Many people with RA develop anemia, or a decrease in the normal number of red blood cells. Other effects, which occur less often, include neck pain and dry eyes and mouth. Very rarely, people may have inflammation of the blood vessels, the lining of the lungs, or the sac enclosing the heart. People with Rheumatoid Arthritis are more prone to atherosclerosis, and risk of myocardial infarction (heart attack) and stroke is markedly increased. 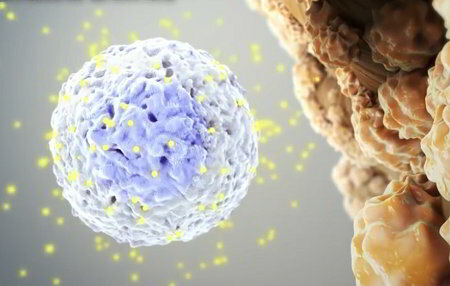 Autoimmune problems such as rheumatoid arthritis can cause reduced lymphocyte counts. Cold, damp weather is well known for aggravating aching bones. Rheumatoid arthritis can flare up during winter months; what might be a dull ache during the summer can become a shooting pain during the winter. "Dry eye" is a symptom of certain autoimmune diseases like rheumatoid arthritis and Sjogren's syndrome. Rheumatoid arthritis patients often complain of prolonged morning stiffness or pain which may last 45 minutes or longer. Rheumatoid arthritis sufferers also experience swelling/bumps in the same joints that are affected by Heberden's nodes, but the bumps are not the same. Rarely, rheumatoid arthritis affects the joints between the ossicles and can cause conductive hearing loss. People with Rheumatoid Arthritis have a higher risk of also being diagnosed with Celiac Disease. Almost all (98%) of Rheumatoid Arthritis patients report fatigue. They also report that it is more of a problem than the stiffness and pain. Rheumatoid arthritis and other inflammatory diseases can cause neutrophilia. A Mayo Clinic study found that the T-cells were 'worn out' in rheumatoid arthritis patients, who do not make new T-cells as readily as they should. Studies report that around 30% of people suffering from inflammatory diseases such as rheumatoid arthritis are depressed – more than four times higher than the general population. Aching, swollen joints may just be demanding the right kind of oil. Shifting the body's balance toward omega-3 oils and away from omega-6 oils significantly alleviates symptoms in patients with rheumatoid arthritis, according to a recent study in the Journal of Rheumatology. People with Rheumatoid Arthritis (RA) are 8 times more likely to have gum disease. In addition, those with RA can have trouble brushing and flossing due to finger joint damage. The thymus gland contributes to the maturing of T-cells. Thymus gland extracts will assist this process when the thymus gland is shrunken, as happens commonly in aging. Through his clinical experiences with thymic supplementation, Dr. Burgstiner said he observed 28 cases of rheumatoid arthritis cases go into remission where patients no longer needed to use prednisone, methotrexate or gold shots. The 'D' form of phenylalanine (DPA) has been used to treat chronic pain, including rheumatoid arthritis, with mixed effectiveness. Open-label studies conducted in India show a preliminary benefit for persons with primarily rheumatoid arthritis. [Langer JG, Gupta OP, Atal CK (1981) "Clinical trials on Picrorhiza kurroa" Ind J Pharmacol 13: pp.98-103 (review)] More study is needed before any definite conclusions can be drawn. Many studies have shown that vegetarian diets can be used to successfully treat rheumatoid arthritis. For some people, the type of protein contained in dairy products appears to contribute to arthritis pain by irritating the tissue around their joints. Many of them find relief by switching to a vegan diet – which contains no animal products whatsoever. We've tried traditional and alternative therapies and medicines, but she only got a little short term relief. We even tried acupuncture. Try finding an acupuncturist in the rural Midwest! It was expensive, and didn't really work. Catherine's pain has been unbearable at times. Despite there being no information on the internet linking dairy consumption to rheumatoid arthritis, and nothing in medical journals (I've searched online Medline), we made a resolution together to discontinue drinking our own milk, and not eat cheese or any other dairy product for six months, just to see if there would be some improvement. I have to tell you this. Catherine feels like she's been to Lourdes. She's cured. There is some pain, but most is gone. I've had changes too which I'll discuss some other time. I thank you, and curse you at the same time. Milking cows is my livelihood. I've always believed that what I was doing was the right thing. I'm not going to sell my cows and sell my farm. I love the business. I just don't feel that good about it anymore. You were right about the arthritis. I don't know about the cancer and heart attacks, but you have given us a miracle that doctors were not able to provide. It did not take us three to six months to learn the truth. It took just three weeks. I've ridiculed your work in the past. Please accept my apology. Since this type of joint pain can be a symptom of food allergy, dietary change may have a profound effect. Dairy products – the most common food allergen – are one likely causative factor. An Autoimmune/Arthritis Disease Panel (Blood) can test for the presence of Mycoplasma fermentans, Mycoplasma pneumoniae and Epstein Barr Virus (EBV). Both Omega-6 and Omega-3 EFAs and their metabolites Gamma Linolenic Acid (GLA) and EPA have shown effectiveness against Rheumatoid Arthritis. One study showed that use for 12 months produced meaningful improvement in 76% of subjects. The oil from cold water fish falls into the Omega-3 category, and has shown positive results in reducing inflammation. Some researchers believe that if you regularly eat small amounts of cold-water fish over many years, you may be able to avoid rheumatoid arthritis.